Dreamers, adventurers, and Disney fans from all over the globe come to Walt Disney World® Resort in Florida because of the sheer scale and epic fun it offers. Not only is there something for everyone; there’s a lot for everyone. But where to begin when planning your vacation day? We’ve created this Day Planner for plenty of ideas and suggestions to get you started; and for Disney® Visa® Cardmembers, you’ll discover plenty of perks along the way, too! Arrive Early to “Let the Magic Begin” with a Show – Just prior to the Park opening, you can start the day off right by seeing “Let the Magic Begin,” the spectacular musical show at Cinderella Castle. This daily tradition features beloved characters, including Princesses from classic films and Mickey himself. You’ll wish every morning came with this sort of “royal treatment”! 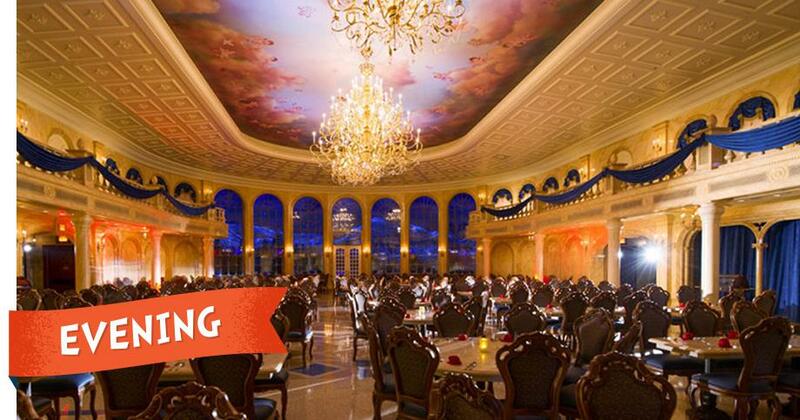 Have a Hearty Breakfast at Gaston’s Tavern – Fill up and flex for a photo all at once! Gaston’s Tavern has plenty of quick-service snack options, including fruit cups and delicious cinnamon rolls. You’ll never know what to expect from a photo with the musclebound mischief-maker if you catch him . . . except he’ll insist on making himself look good! Have a Jewel of a Time on Seven Dwarfs Mine Train – Hi ho, hi, ho, through the diamond mine we’ll go! One of Magic Kingdom® Park’s newest attractions is also one of the most thrilling and popular, so arrive at Fantasyland at the beginning of the day or grab a FastPass+, either in the Park or booked in advance, for a shorter wait among all the dazzling gems! Disney Moms Panel Tip: Start the day with all the info you’ll need in the palm of your hand! The official My Disney Experience mobile app turns your phone into a “magic mirror” that will help you keep your whole day on schedule, including wait times, show times, restaurant reservations, Character Experience times and locations, and much more! 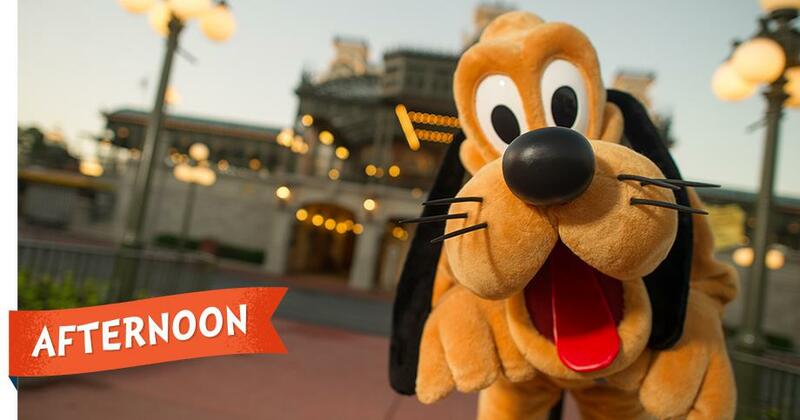 Add One of Your Favorite Characters to Your Family Photo – No matter where you’ve roamed by the afternoon, there are beloved Disney characters waiting to meet you! From Pluto in Town Square to Aladdin in Adventureland, check out all the Character Experiences available via your My Disney Experience mobile app and bring a famous face into your group photo! And don’t forget to bring an autograph book with you so you’re ready to collect those special character signatures throughout your day! Take a Break to “Wave” Hello to Lunch – Just because you’re making the most of your day doesn’t mean you can’t take a break! Rest up and catch your breath for a brief intermission from the Park’s excitement. The Wave restaurant at Disney’s Contemporary Resort is a short monorail ride away, and Cardmembers get 10% off dining at this location!3 So grab a seat and savor your lunch in style, surrounded by the relaxing, modern atmosphere. Seek Out Adventure and Dessert – Now that you’ve rested, adventure calls! The monorail will drop you off a short walk from Adventureland, where you can grab a delicious Dole Whip for dessert, say hello to wacky wildlife on Jungle Cruise, or get the classic tunes from Enchanted Tiki Room or Pirates of the Caribbean stuck in your head! Take in the Disney Festival of Fantasy Parade – At 3:00 PM every day in Magic Kingdom® Park, music and dance come to Main Street, U.S.A., along with friends from classic films and new favorites waving “hi” from festive floats. As parade times are subject to change, refer to the My Disney Experience mobile app for the most accurate information. Come early for curbside seats or just stand near Cinderella Castle whenever you arrive; either way, you’ll see all the excitement and hear all the sounds! Disney Moms Panel Tip: If you and your team are seeking some shade in the middle of a sunny day, there are several options throughout the Park for getting off your feet into a comfy seat and enjoying some AC without missing a moment of entertainment! We recommend Walt Disney’s Enchanted Tiki Room, Walt Disney’s Carousel of Progress, Mickey’s Philharmagic, or “it’s a small world”®! Visit Tomorrowland, Tonight! – After a feast fit for a fairy tale, it’s time to feast your eyes on the colorful neon and futuristic features of Tomorrowland at night! Go into the galaxy on Space Mountain®, get airborne on Astro Orbiter, or take a spin on Walt Disney’s Carousel of Progress as you explore this illuminated environment. Get a Thrilling View of Disney’s Lights at Night – A thrilling attraction can take your breath away with a view, as well as with twists, turns, and drops! 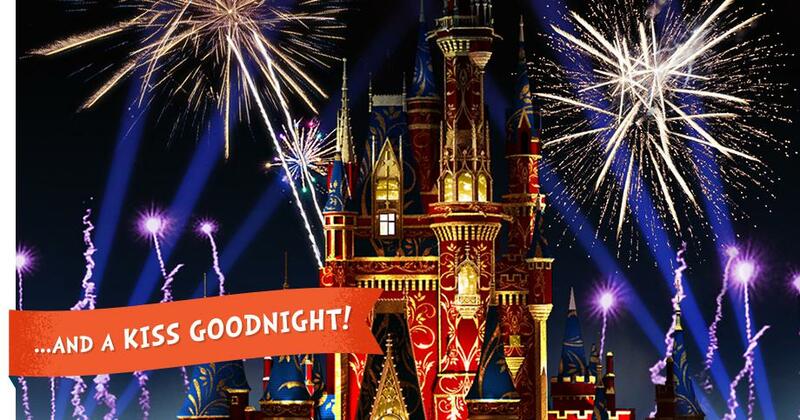 To see as much of Magic Kingdom® Park at night all at once, we recommend the heights of popular attractions like Astro Orbiter, Splash Mountain®, and Big Thunder Mountain Railroad! Disney Moms Panel Tip: A day full of fun can tire you out along the way, so remember to take advantage of the fun and helpful transportation around the Park. Options like the monorail, the Main Street, U.S.A. trolleys, and the Walt Disney World Railroad make stops at Fantasyland, Frontierland, and Main Street, U.S.A., with scenic views along the way! Happily Ever After – On select nights, the fireworks extravaganza above Cinderella Castle will top the day off with a grand finale. The sky’s the limit for this world-premiere show that incorporates characters and voices from Disney classics. From The Little Mermaid to Moana, it has special effects you’ll have to see to believe and which you’ll remember, for countless nights to come. As always, be sure to check with a Cast Member or view the daily schedule for up-to-date show times, information and in case of inclement weather. Disney Moms Panel Tip: For an even sweeter way to witness Happily Ever After, reserve a special experience at Tomorrowland Terrace where you can sample an array of scrumptious treats and enjoy spectacular views of the fireworks! Be sure to book your reservation well in advance, as these seats do fill up quickly! Not yet a Cardmember? 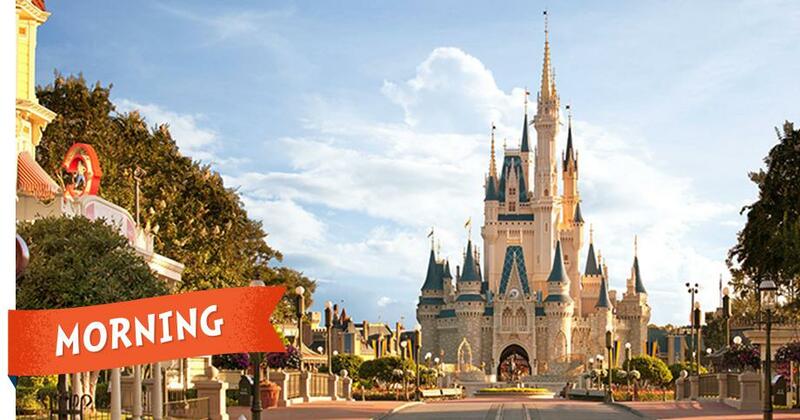 Discover how Disney Rewards can take your next visit to Magic Kingdom® Park at Walt Disney World® Resort to the next level. And, if you’re heading to Disneyland® Park instead, check out our guide for a one-of-a-kind day for that Park here!